What would you do if you got a fake bill from a bank? PHOENIX, AZ — What if you got a counterfeit bill from a bank? What would you do? Viewer Deteryon let me know. He says he went into a local bank and got cash from his $3,900 check. He went across the street to make a deposit at his bank but was told one of the hundred dollar bills was fake. When he couldn't get action, the Let Joe Know/Better Business Bureau problem solvers took over. Volunteer Grant spent six weeks phoning and emailing. Eventually he got the right people and Deteryon got his real hundred dollar bill. Then there's Michael who says he bought a new computer that just randomly shuts down. He says the manufacturer told him it was a hardware issue and to take it back the store for a replacement. But the store wouldn't budge until they got a chance to repair it. Michael is a student and needs his computer. He couldn't afford to give it up for an extended amount of time so he let me know. And in comes our volunteer Barbara. She found the store didn't even carry the computer anymore. Barbara got them to issue him a credit for the full price of his laptop. 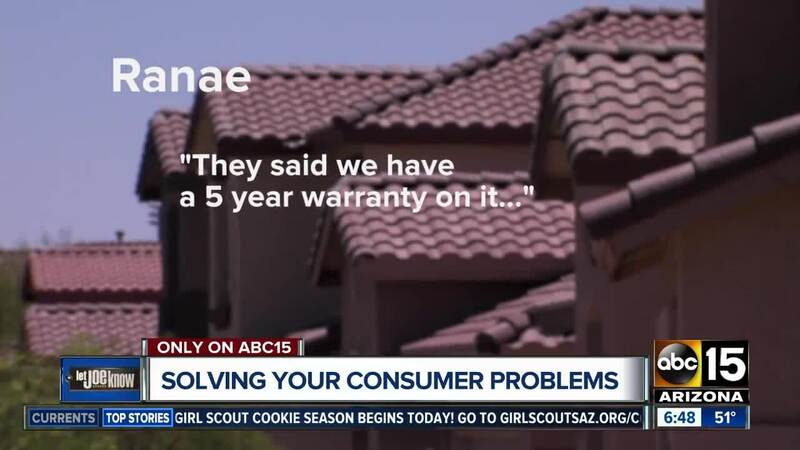 Finally, viewer Ranae wanted a roofing company to make good on a five year warranty. She says "since it's been raining there've been lots of leaks" and the company is ignoring her. Volunteer Preston was on the case. He spent time contacting the company and getting them to do an inspection. Afterward they agreed to live up to their warranty and repair the roof. Make sure to keep a copy of your warranty. Know what it covers and if the company won't hold up it's end let me know.